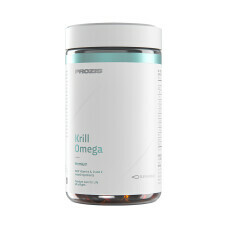 Krill is a generic name used for several species of invertebrate animals, morphologically similar to shrimp. These species contain certain fatty acids that are alike those found in fish oil, such as omega-3, and astaxanthin which in fact is a powerful antioxidant. Omega-3 is a fatty acid that is essential for normal growth and development of the body, and must be obained from foods or supplements as the body itself is unable to produce it.